Last month I wrote about the probability of America going bankrupt and the aftermath of that Most experts see that possibility at 4 to 10 years from now. But this is without any other major problems like a new war in critical war zones of the world. Before getting into what major problems can and might happen, we must know and admit what drives economies and always has. From the time of cave men, the number one component of prosperity has been energy. At first it was the energy of hard working individuals. Then it was the tools that made that energy produce more, Then it was the use of animals to do part of the work. Then the use of wind power to drive ships over the seas and water out of wells. Then steam energy to replace wind and animals for transportation on land and sea. Then comes oil to replace the steam engine and the horse drawn carts and plows. Oil and electric power (powered by coal) became the greatest boom to world wide economy than any other thing in history. After this came nuclear power. Nothing has replaced these two things and nothing will for the next 50 years. Wind and solar are jokes and will never amount to more than 7% of our energy needs. Understand that all production today depends first and last on energy and production is the blood of economy and economy the key to survival. Now to go back to what could cause America to go bankrupt sooner than some think? I have often thought it would be a war between Israel and Iran, with Israel probably attacking Iran's military complex and government in hopes to overturn the government. This would stop 60% of the world oil supply overnight, at least for a time. However, I just read Byron King's prediction and I find it more credible than mine because he reminded me of the history of Islam that I had forgotten. Did you ever think of why more Moslems are being killed by other Moslems each and every day, than non Moslems? Everyday we see hundreds of Moslems being killed in bombs and shootings. Is this something new? No, it has been going on for over 1300 years. It started at the death of Mohammad, himself. As many as eight key Islamic countries are hurtling headlong toward a bloody "new" war with each other that's been FOURTEEN CENTURIES in the making. This could begin as early as the next 12 to 18 months. And with no less than 66% of the world's key energy reserves smack dab in the crosshairs. All the way back to a lamb dinner, served up one evening in the year 629 AD... Nobody could have known that the dinner they were about to eat would one day change history. Some say it was goat. Others say it was lamb. Either way, it was poisoned. And the guest of honor was Mohammed, the controversial founder of Islam. It was just one bite, that's all it took. He tasted the poison and immediately spit it out. But it was too late. He would soon die, sparking a bitter and deadly divide. When Mohammed died nobody could agree on who should take over... And they've been killing each other as a result ever since. On the one side, you've got the Sunni Muslims. They're the ones that run Saudi Arabia, Egypt, Jordan, and many of the other countries in the Middle East. On the other, you've got the Shia Muslims. It's the Shiites that run Iran. And now run Iraq, as well as Lebanon and Syria. This Sunni-Shia split has built up pressure now for the last 1,354 years. But it's only now that this pressure has found its ultimate release with Iran driving a new Shia uprising smack dab in the middle of the most dangerous place on Earth the oil-soaked Middle East. Isn't the Middle East already a mess? Yes, it is. and some of the most strategic territory in the entire Middle East! One terrorist with a grudge can do a lot of damage. Iran, all by itself, could even be a deadly force. But can you imagine what millions of Shiites with a 1,354-year old ax to grind could do? Nobody knows exactly how many Shia there are right now in the Middle East. That's because in all but four Middle Eastern countries, Sunni leaders don't bother to count. Sunni schools teach that Shiites aren't real Muslims. Shias don't get a seat in government. They can't become judges or even testify in high courts. In Sunni-run Saudi Arabia, Shites and Sunni can't even marry. For centuries, the Shia have been the underclass. But now, for the first time in history, they see this as their chance to turn the tide. And how big a tide is it? Hands down, saber-rattling Iran has the most 70 million Shia. But then you've got the "liberated" Shia of Iraq 22 million. Plus as many as 2 million Shia in Iran-backed Lebanon. And up to 4 million Shia in Iran's top ally, Syria. Then you've got another 700,000 Shia in Kuwait... up to 500,000 Shia in Bahrain... up to 400,000 Shia in the United Arab Emirates... 300,000 Shia in Oman... and around 100,000 Shia in Qatar, according to the Pew Research Center in Washington. On top of that, as many as 10 million Shia in Yemen... another 7 million Shia in Azerbaijan... and 11 million Shia in Turkey... not to mention the combined 30 million Shia in Afghanistan and Pakistan. Not all Shia want a revolution, but out of between the 147 million to 162 million Shia spread from Pakistan to Lebanon and Azerbaijan to Yemen, enough do that this is the river of "Secret Revenge" and common blood running through the entire Middle East. The Sunnis are worried. Especially in Sunni-run Saudi Arabia. And especially now. Don't forget, Iran used to be Persia. At one point Persia was the biggest and most powerful empire in history! Iraq, Syria, Turkey, Egypt even Israel the Persians controlled them all. Along with all of Afghanistan and Pakistan and most of the oil-rich coast of the Caspian. For 300 years, Persian armies held off the Roman Empire. Their scholars walked with Aristotle and Plato. And influenced Greek art. It was the Persians who invented chess. And the windmill. Not to mention bricks, algebra, trigonometry, and wine. The bottom line is... no Empire forgets its past glory. The Iranians resent losing theirs. But now they see a chance to get it back. The nuclear bomb? Tehran's crackpot leaders don't just want it to scare Israel. They want it so they can throw a dark shadow over their Sunni Arab neighbors, too! for kicking off the long-awaited "Shia Revolution." First, you'll see how Iran's Shia influence has spilled across the border into southern Iraq. Southern Iraq is where you'll find six of Iraq's eight "Supergiant" oil fields. It's also where you'll find a key border with Shia Islam's mortal enemy Saudi Arabia. Because of Iraq's Shia majority, when America pulls out it will join with Iran and be a new threat to Saudi Arabia, a Sunni nation. For eight years back in the 1980s, Saudi Arabia helped Iraq wage a bloody war against Iran. Along with other Sunni governments, the Saudis even gave Saddam over $47 billion to launch missiles and nerve gas attacks over the Iranian border. Iran hasn't forgotten. Or forgiven. (Imagine if Canada or Mexico had given money to Japan to help them bomb Pearl Harbor. Iran has waited to make the Saudis pay and now they have their chance. The second thing you'll see in the map above is that Iran has almost total control over the Strait Hormuz. Hormuz is the tight waterway that connects the Persian Gulf to the Mediterranean. Over 17 million barrels of oil have to pass through Hormuz every day. That's 40% of all the oil shipped in the world. And 90% of all the daily oil shipments from the entire Middle East. 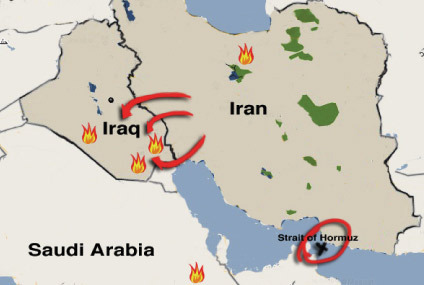 With Hormuz alone, Iran could cripple the world overnight. Today, Iran backs Shia militants in Iraq. They give them money and guns. They've even helped Shia politicians take over the Iraqi government. Why? Because gaining control in Iraq takes the Iranians one step closer in their twisted plot for secret revenge. For another one of those steps, just look further south... to Yemen. The Pentagon has just tripled its budget on Yemen. Top U.S. General Patraeus just had a not-so-secret meeting with Yemen's president. And our own State Department calls Yemen a threat... to global stability. Yemen might be a failed country... with a collapsing government, a shrinking oil supply, an exploding population and not much of anything else but lawlessness and chaos. But what Yemen does have is position. 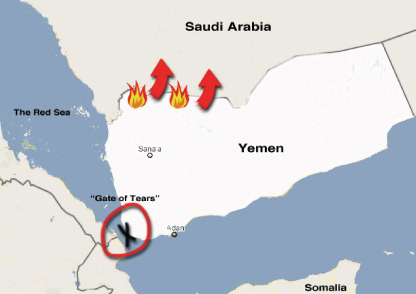 It sits just on the tip of the Arab peninsula... south of another key Saudi border and on the coast of another key oil strait called Bab-el-Mandeb. That name means the "Gate of Tears." And like Hormuz, most oil states on the Red Sea can't get a drop of oil out without shipping it through the Bab-el-Mandeb. Over 3.3 million barrels go through every day. Blocking this chokepoint alone could slap a $30 "political premium" on the price of every barrel of oil... but there's an even bigger threat taking shape. For the last six years, Yemen has fought a vicious and bloody war with Shia rebels. These rebels are poor. There's no way, says a Yemen general, these rebels "could fund and fight this war with pomegranates and grapes... no doubt there is Iranian support." Could it be true? Absolutely. Iran loves to buy loyalty. Take the $1 billion Tehran now "donates" every year to Hezbollah terrorists in Lebanon. Or the billions they gave Syria's Shia president to build cement factories, car factories, power plants, and storage silos. In return, Iran gets Hezbollah's Arabic-speaking terrorists to run militant Shia training camps in Iraq. And gets Syria to distribute Iran's money and weapons to others in the Shia network. The secret money Iran sends to Shia rebels in Yemen could soon have a payoff too by opening up another route for "backdoor" Shia access into Saudi Arabia. Yemen's rebels have already hit towns across the Saudi border. And the Saudis have hit back, losing dozens of troops in the process. We're just in the first innings of this one. So far, 50 Saudi schools along the border have had to close. Another 240 border towns have already been evacuated. And Saudi jets have already dropped bombs in Yemen. What exactly has the Saudis running scared? Don't think for a minute that I think Iran's plot for "secret revenge" could succeed. But the threat alone could be enough to kick oil much higher. And sooner than you might think. · The Times of London uncovered a confidential document that says Iran already has a "neutron initiator" ready to test. That's the part you need to trigger a warhead. · And Der Spiegel, the German magazine, says Iran may even have the tech and material to build a simple nuclear bomb before the end of THIS year. But the Bomb is just a beginning. Even if the go ahead to build a nuke never comes from Iran's top cleric, the more immediate danger is a wildfire of Shia-Sunni unrest... starting in Iran's new hotbeds of Shia support... and spreading across the rest of the Sunni-run oil states... with the richest oil fields in the world's richest oil nation as the final battleground. The Final Battleground — Saudi Arabia! 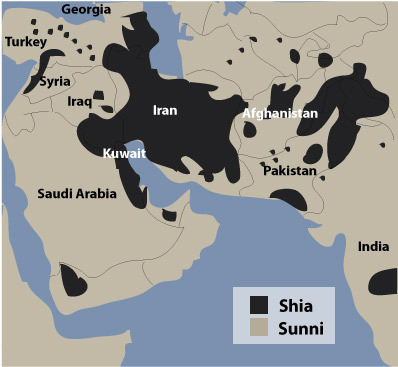 millions of Shia even live on top of the Saudis OWN biggest oilfields. As you can see, Saudi Arabia looks like a sitting duck. 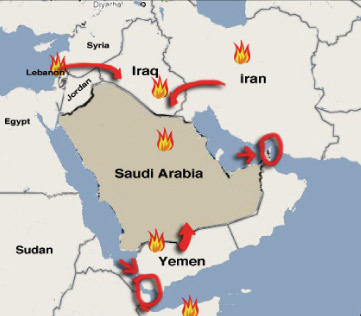 Iran has a Shia network that reaches from Afghanistan to Lebanon once again... more connections building along the Persian Gulf... Yemeni Shias to the south... and Shia connections along the oil rich Caspian Sea. You could see this spread to the nearly two million Shia that live and work on Saudi Arabia's oil fields very soon. Even though that's exactly what the Saudis and our own Pentagon hope will never happen. Abu Dhabi alone has already bought $17 billion worth of U.S. anti-missile hardware. And the United Arab Emirates and Saudi Arabia just splurged on weapons, to the tune of $25 billion. As you read this, our own F-16 fighter jets, Patriot missile systems, giant cruisers and up to 20,000 more U.S. troops are quietly digging in for an epic fight... that could spread past Iraq and Yemen... and even into Qatar, the United Arab Emirates, and Bahrain. All to get ready for what could be the fight of a lifetime... Say Hello to the "Jihad Generation"
It's not just our experts saying it. Leaders in all three of America's biggest Middle East allied countries Egypt, Jordan, and Saudi Arabia claim the epic Sunni-Shia showdown is in the cards. It could start from any one of the flashpoints I just named. But no matter how it starts, Saudi Arabia is where it's most likely to end up. Why? Not only is Saudi Arabia home to Mecca, Islam's holiest place... but it's also home to the corrupt and U.S.-allied Royal House of Saud, considered an insult to all Islam. In a country where they'll cut off your hand for stealing and whip you for holding a glass of whiskey... Saudi princes gorge on cocaine and prostitutes, gambling, palaces, and more. All while the vast Saudi underclass starves on just $6,000 per year and 30% unemployment. And as many as two million of that underclass is Shia. With a 1,354-year-old ax to grind and billions of dollars in oil revenues as the prize. It's a near-perfect formula for a FULL-ON war. And the fuse is already lit. Iran is ready to assert its place in the world. Think Japan or Germany in the 1930s. The threat is there, it's large, and it's not going away anytime soon. How the world responds, we can't know. But I can tell you how oil could respond... by exploding to new record highs. Possibly as high as $220 per barrel by spring of the coming year... with gas not topping out until it hits as much as $8 per gallon. That's very bad news for millions around the world. Have no illusions any military response, on any front could only accelerate the spike in oil prices. So the first thing you're going to want to do is simply get out of the way. What critical resource need helped drive Germany into BOTH world wars... drove Japan to bomb Pearl Harbor... and helped fuel the Allies that crushed them? Oil. After the Yom Kippur War... during the Iranian hostage crisis... during countless clashes in Palestine and Israel... during both Gulf Wars... we saw oil prices take off. Like I said, the rising threat alone... so close to nearly 66% of the world's shrinking oil and gas reserves... could be enough to set this price explosion into motion. Oscar Wilde once said, "Ordinary riches can be stolen, real riches cannot." I don't need to tell you, between plundering banks and blundering bureaucrats, a lot of regular Americans have watched their 401k and retirement "riches" stolen right out from under them, these past couple of years. But when push comes to shove... in times of historic growth and epic crisis... what's the one thing that's endured? For as long as anybody's kept track, it's "stuff"... real, tangible, usable, tradable, blatantly valuable wealth. In short, the raw resources you need to thrive and survive. It's really that simple. It's no accident that's where the smart money flocks in good times and bad. It's also no accident that this is the story of one great fortune after another. · John D. Rockefeller built a staggering fortune worth $212 billion in today's dollars and nearly four times bigger than Bill Gates stash of $57 billion with Standard Oil. · Just before the crash of 1929, Rockefeller and other mega-rich investors like J.P. Morgan, Joseph F. Kennedy, and Bernard Baruch ALL shifted out of stocks and into gold getting even richer in the process. · Andrew Carnegie who also crushes Gates with a fortune worth nearly $112 billion in today's dollars got that rich making steel. · Frederick Weyerhauser, worth more than $72.2 billion in today's money, made all of that after starting out with timber, land, and saw mills. · Andrew Mellon and his brother Richard each made about $36 billion, in today's terms, by branching out from banking and into oil, steel, aluminum, and coal. Forests that became armadas... coal and iron that made England an industrial power... steel that made America... the list goes on. And this has never been more true than right now. What both the Federal and State government have in common right now, is unemployment and debt, and both caused by refusing to face the energy problem that has gone on for twenty years. There is only one way to solve this problem and that is to cut government spending by 40% and create jobs through energy. Only energy can create enough jobs to raise the GDP enough to pay the National and State debts. On the side of creating jobs, only energy can do that. The government has to make it as easy and swift as possible to drill in the oil shale and oil sand regions of North Western USA where we have more oil than all of the Middle East (enough for all America's needs in oil and gas for a 100 years and enough to export oil to China). We must make it as easy as possible to open the oil reserves in Alaska or and off shore, and build the pipe lines needed. We just open the off shore oil fields and stream line the regulations to get this drilling going as soon as possible on all three coasts. The government has to make it as easy and swift as possible to built new nuclear power plants. We need at least 100 new power plants in the near future just to take care of America's new electric demands. The government has to make it as easy and swift as possible to built the systems on the highways to convert our trucks and cars to natural gas. There are enough potential jobs just in the energy market to bring unemployment down to under 4% but it will require government to cooperate and to train workers in these new fields of education. On a personal level you should assume the government will not do the above and will collapse in time. If you live pay check to pay check there is not much you can do. But for those who do or can save some money each month I give this advice. Keep enough money for your monthly bills but cut that down as much as you can. Take all your excess money and convert it to “things” like oil, gas, food, uranium, coal and gold. You can take these things in product or stocks but they will go up in value as your money goes down in value. 1. The single biggest energy breakthrough in 100 years just took place nearly five miles below the surface of the sea. Brand new technology finally makes it possible to tap as much as 100 billion barrels of new oil. This is off the shores of Brazil. the Tupi 240 miles off the coast of Brazil. 5 miles deap and 19,000 feet through multi-million year-old anthracite and salt deposits to get to the beds of ancient limestone that hold the oil. Crews go out on massive ships to set up the rigs. They use satellite images to find the deposits and then automated underwater robots to lock the drilling equipment into place. Just tapping the deposit can take as many as three months to set up... at a cost of as much as $600,000 per day. Even to hire a helicopter to fly to the offshore drilling sites can take as long as two-hours over open water and up to $50,000 for the fuel and pilot... for each flight. 2. Proven reserves of Norway in a deposit almost 500 miles long and 100 miles wide what could be as much as 100 billion barrels of oil. Easily, that's the biggest single oil-bearing zone anywhere in the world. Bigger than almost all the oil fields in Iraq, combined. Bigger than all the reserves in Russia. Or Iran, for that matter. Bigger than the Saudi's legendary Ghawar. · 3. We now have the famous Bakken Oil Formation here in the U.S. which also has more oil and gas than all the middle east put together and with a new invention by Swiss scientists can be easily brought out of the ground at $30.00 per barrel. Oil is now at $90 per barrel and is predicted to go to $200 this year. 4. China's make deals for more power, including multi-billion dollar deals with our enemies in Iran.China could go bust if they don't fix their growing energy problems. So they're ramping up to go nuclear instead. China is already so short on coal to fuel their power plants... they have to shut out the lights in Shanghai and other big cities, just to save on electricity! Long-term, that can't work so they're going nuclear, with plans to build three times as many uranium-fueled power plants. China has 11 nuclear reactors producing electricity. They're already building 17 more. But they want to rocket that number to 124 full capacity reactors over the next several years. The last full year on record, China used 769 tons of uranium. Beijing's new plan would call for 20,000 tons per year. Right now around the world, you've got 436 nuclear reactors up and running. Plus another 50 being built. And another 137 reactors in the blueprint stage. Along with 295 more new reactors on the table for approval. The U.S. just announced plans to start building more on top of the 104 reactors we've already got going. In fact, the U.S. already gets about 20% of its power from reactors. And we're on track to make more. It's not hard to do the math. Even Belgium, Sweden, South Korea, Switzerland, Japan, Spain, the U.S., the U.K., and France all get between 23% and 75% of their power from nuke plants. And those numbers are going up too. First, guess who doesn't. Uranium deposits are hard to come by in the Middle East. Instead, you've got Australia, the U.S., Canada, France, Argentina, Brazil, and India dominating the market. Along with South Africa, Nigeria, Algeria, and Gabon. 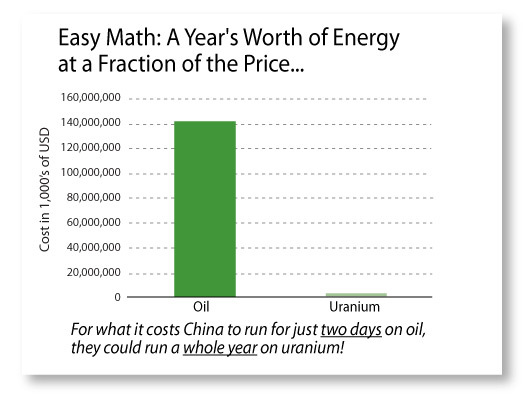 Uranium could hit over $60 this year $250 uranium in the near future. While S&P stocks fell 9.7%... gold shot up 323%. From 1979 to 1982, during the Iranian hostage crisis and the worst inflation the U.S. has seen yet, the yellow metal surged 2,329% It now sets at $1400. What about the future of gold? The IMF is dumping gold to finance Europe. Some world banks are getting out of gold, and yet gold is not going down. Why? India is using gold as one of their currencies and trading gold for oil. China is buying gold as fast as they can because they want to back their currency with gold to stabilize their currency and make it more valuable than the Dollar. Brazil is doing the same. More and more countries are trying to trade currencies for gold because they know gold will go up and they can always use gold to buy products they need like oil, coal, food and metals. Precious Metals are now in very short supply and are used in all the new technologies so now old mines have to be re-opened and investment will bring big returns. Molycorp precious metals is a good buy.